Nitric oxide is an important substance for your cardiovascular and sexual health. Nitric oxide is a gas that relaxes and widens your blood vessels, lowers blood pressure and increases blood flow. Increasing production of nitric oxide protects against cardiovascular disease and erectile dysfunction. Arginine and citrulline are two amino acids that play vital roles in producing nitric oxide. Consult your doctor about the supplements and foods that increase nitric oxide production. Arginine is a semi-essential amino acid children require from foods and adults can make in the body. Arginine is a precursor to nitric oxide. Increasing dietary intake of arginine from food and supplements increases production of nitric oxide. Taking arginine supplements improves blood pressure and blood flow and reduces risk of cardiovascular disease. Scientists at the Scientific Institute of San Raffaele in Milan, Italy, evaluated the effects of arginine supplementation on nondiabetic patients with cardiovascular disease, according to research published in "Metabolism: Clinical and Experimental" in September 2009. The scientists found arginine supplements increase nitric oxide production, reduce inflammation and improve cardiovascular function. Citrulline increases nitric oxide production by increasing arginine levels, which in turn converts into nitric oxide. Taking citrulline supplements reduces your blood pressure. Scientists at Florida State University in Tallahassee found that oral citrulline supplementation lowers blood pressure, according to research published in the "American Journal of Hypertension" in January 2010. The results demonstrate citrulline reduces blood pressure in both the brachial artery in the upper arm and aorta artery that carries blood from the heart to the body. The scientists report this finding is significant because aortic blood pressure better reflects cardiovascular risk than brachial blood pressure, which is easier to measure and is the more conventional measurement. Arginine is found in meat, fish, dairy, eggs, nuts, seeds, whole grains, chocolate, carob and legumes, particularly soy; however, research is limited in demonstrating the types of foods containing arginine that will increase nitric oxide production. Pistachio nuts contain high concentrations of arginine, increase your production of nitric oxide and can help men with erectile dysfunction. Erectile dysfunction is associated with low levels of nitric oxide production, due in part to dietary arginine deficiency, according to research by scientists at the Tokyo Medical and Dental University in Japan and published in the "International Journal of Urology" in February 2008. Scientists at the Ataturk Teaching and Research Hospital in Ankara, Turkey, found that married men with erectile dysfunction who consume Antep pistachios improve erectile function without any side effects, according to research published in the January/February issue of "International Journal of Impotence Research" in 2011. 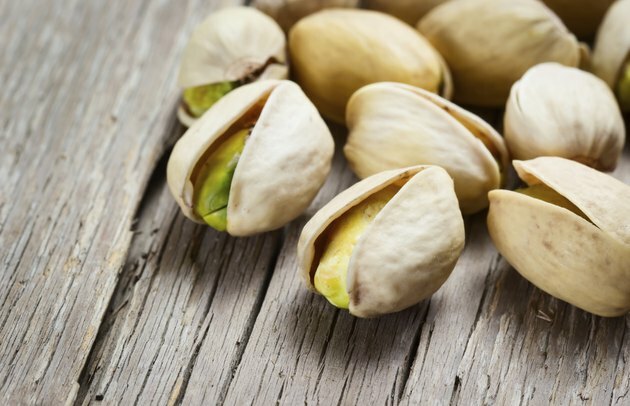 The results also demonstrate pistachios lower blood cholesterol and fat and improve cardiovascular health. Citrulline is found in cucumbers and melons, such as watermelon and cantaloupe; however, research is limited in demonstrating the types of foods containing citrulline that will increase nitric oxide production. Watermelon, including the flesh and rind, is a rich source of citrulline. Increasing your dietary intake of watermelon increases your production of nitric oxide and may lower blood concentrations of cardiovascular risk factors. Scientists at Texas A&M University in College Station discovered that watermelon rind juice increases blood concentrations of arginine, improves blood vessel relaxation and lowers blood sugar concentrations of sugar, fat and dimethylarginines, substances that increase the risk of atherosclerosis, according to research published in the "Journal of Nutrition" in December 2007.